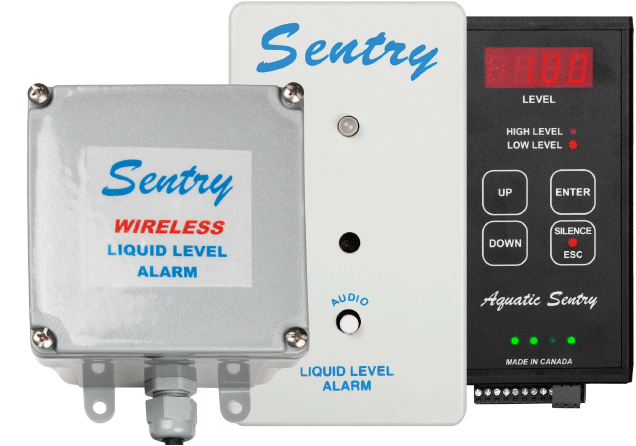 Aquatic Sentry Controls Inc. specializes in reliable, simple, and accurate liquid-level monitoring and control. Monitor water levels in cisterns, sumps, septic systems, holding tanks, pools, trucks, water treatment plants or storage tanks. Alarm high or low level conditions and control equipment. Unique Digital RF technology measures the water level through plastic coatings on the probes or sensors. These instruments self-test that the components are operating correctly, giving the highest level of reliability. Copyright © 2016 Aquatic Sentry Controls Inc.